by Siegel, Seth M [author.]. Introduction: A global water crisis looms -- Part I: The creation of a water-focused nation. A water-respecting culture ; The national water carrier ; Managing a national water system -- Part II: The transformation. Revolution(s) on the farm ; Turning waste into water ; Desalination: science engineering, and alchemy ; Renewing the water of Israel -- Part III: The world beyond Israel's borders. Turning water into a global business ; Israel, Jordan, and the Palestinians: finding a regional water solution ; Hydro-diplomacy: Israel's use of water for global engagement ; No one is immune: California and the burden of affluence -- Part IV: How Israel did it. Guiding philosophy. Summary: "As every day brings urgent reports of growing water shortages around the world, there is no time to lose in the search for solutions. The US government predicts that forty of our fifty states-and sixty percent of the earth's land surface-will soon face alarming gaps between available water and the growing demand for it. Without action, food prices will rise, economic growth will slow, and political instability is likely to follow.Let There Be Water illustrates how Israel can serve as a model for the US and countries everywhere by showing how to blunt the worst of the coming water calamities.Even with sixty percent of its country a desert, not only doesn't Israel have a water problem; it has an abundance of water. Israel even supplies water to its neighbors-the Palestinians and the Kingdom of Jordan-every day.Based on meticulous research and hundreds of interviews, Let There Be Water reveals the methods and techniques of the often off-beat inventors who enabled Israel to lead the world in cutting-edge water technology. Let There Be Water also tells unknown stories of how cooperation on water systems can forge diplomatic ties and promote unity. Remarkably, not long ago, now-hostile Iran relied on Israel to manage its water systems, and access to Israel's water know-how helped to warm China's frosty relations with Israel. Every town, every country, and every reader can benefit from learning what Israel did in order to transform itself from a parched land into a water superpower.Beautifully written, Let There Be Water is an inspiring account of vision and sacrifice that will long be admired by government officials and engaged citizens facing water shortages and other seemingly insurmountable challenges"-- Provided by publisher.Summary: "With hardly a day without a water-crisis story somewhere, Let There Be Water offers prescriptions on how countries, cities, and businesses can avoid the worst of it. With sixty percent of the country in a desert and despite a rapidly growing population, Israel has been jumping ahead of the water-innovation curve for decades. Israel's national unity and economic vitality are, in part, the result of a culture and consciousness that understands the central role of water in building a dynamic, thriving society. By boldly thinking about water, Israel has transformed the normally change-averse, water-greedy world of agriculture with innovations like drip irrigation, creation of smart seeds for drought-friendly plants, and careful reuse of highly treated waste-water. Israel has also played a leading role in the emerging desalination revolution. Beyond securing its own water supply, Israel has also created a high-export industry in water technology, a timely example of how countries can build their economies while making the world better. Built on meticulous research and hundreds of interviews with both world leaders and experts in the field, Let There Be Water tells the inspiring story of how this all came to be"-- Provided by publisher. With hardly a day without a water-crisis story somewhere, Let There Be Water offers prescriptions on how countries, cities, and businesses can avoid the worst of it. With sixty percent of the country in a desert and despite a rapidly growing population, Israel has been jumping ahead of the water-innovation curve for decades. Israel's national unity and economic vitality are, in part, the result of a culture and consciousness that understands the central role of water in building a dynamic, thriving society. By boldly thinking about water, Israel has transformed the normally change-averse, water-greedy world of agriculture with innovations like drip irrigation, creation of smart seeds for drought-friendly plants, and careful reuse of highly treated waste-water. Israel has also played a leading role in the emerging desalination revolution.Beyond securing its own water supply, Israel has also created a high-export industry in water technology, a timely example of how countries can build their economies while making the world better.Built on meticulous research and hundreds of interviews with both world leaders and experts in the field, Let There Be Water tells the inspiring story of how this all came to be. "As every day brings urgent reports of growing water shortages around the world, there is no time to lose in the search for solutions. The US government predicts that forty of our fifty states-and sixty percent of the earth's land surface-will soon face alarming gaps between available water and the growing demand for it. Without action, food prices will rise, economic growth will slow, and political instability is likely to follow.Let There Be Water illustrates how Israel can serve as a model for the US and countries everywhere by showing how to blunt the worst of the coming water calamities.Even with sixty percent of its country a desert, not only doesn't Israel have a water problem; it has an abundance of water. Israel even supplies water to its neighbors-the Palestinians and the Kingdom of Jordan-every day.Based on meticulous research and hundreds of interviews, Let There Be Water reveals the methods and techniques of the often off-beat inventors who enabled Israel to lead the world in cutting-edge water technology. Let There Be Water also tells unknown stories of how cooperation on water systems can forge diplomatic ties and promote unity. Remarkably, not long ago, now-hostile Iran relied on Israel to manage its water systems, and access to Israel's water know-how helped to warm China's frosty relations with Israel. 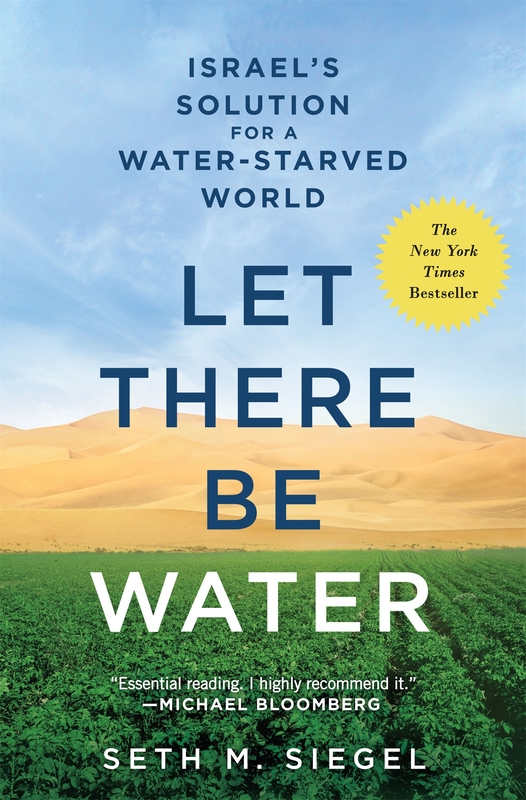 Every town, every country, and every reader can benefit from learning what Israel did in order to transform itself from a parched land into a water superpower.Beautifully written, Let There Be Water is an inspiring account of vision and sacrifice that will long be admired by government officials and engaged citizens facing water shortages and other seemingly insurmountable challenges"-- Provided by publisher. "With hardly a day without a water-crisis story somewhere, Let There Be Water offers prescriptions on how countries, cities, and businesses can avoid the worst of it. With sixty percent of the country in a desert and despite a rapidly growing population, Israel has been jumping ahead of the water-innovation curve for decades. Israel's national unity and economic vitality are, in part, the result of a culture and consciousness that understands the central role of water in building a dynamic, thriving society. By boldly thinking about water, Israel has transformed the normally change-averse, water-greedy world of agriculture with innovations like drip irrigation, creation of smart seeds for drought-friendly plants, and careful reuse of highly treated waste-water. Israel has also played a leading role in the emerging desalination revolution. Beyond securing its own water supply, Israel has also created a high-export industry in water technology, a timely example of how countries can build their economies while making the world better. Built on meticulous research and hundreds of interviews with both world leaders and experts in the field, Let There Be Water tells the inspiring story of how this all came to be"-- Provided by publisher. Includes bibliographical references (pages 309-320) and index. Lawyer and activist Siegel believes a global fresh water crisis is looming owing to climate change, population growth, pollution and an expanding middle class. Yet, Israel, entirely desert or semiarid land with an increasing population, is able to feed itself and export food and water. The author spends most of the book explaining how the country achieved this feat. He outlines the sacrifice and planning of the early decades, then the development of home-grown technology. For example, all citizens are taught to conserve, the state owns all fresh water and charges for it, and drip irrigation was invented there. Farmers have chosen and bred crops that can survive in a dry environment with brackish water. Reclamation is also a factor: most of the wastewater is treated and held in reservoirs for use in irrigation. Desalination plants have become important components of the water surplus and allow Israel to supply Jordan and the Palestinian Authority. The state supports water technology research which helps generate revenue for export. Other nations acknowledge this expertise by hiring Israeli consultants to deal with water issues. VERDICT With current drought conditions across Western North America, this hard-won water wisdom should be of interest to concerned readers.-David R. Conn, formerly with Surrey Libs., BC © Copyright 2015. Library Journals LLC, a wholly owned subsidiary of Media Source, Inc. No redistribution permitted.